This path is for teams who need to quickly become collaborative, innovative, productive and high-performing, and teams who could benefit from learning how to manage conflict, build trust and communicate more effectively with one another. Give your team the opportunity for 360 feedback on the seven critical competencies for emotionally effective teamwork. When each team member rates the team’s skills from his or her perspective everyone can see where the team feels it is strong as well as where it is struggling. There has never been a time when stress tolerance was more critical than it is today, and with a little attention and regular practice, all teams can improve their ability to manage stress, resolve conflict, or enhance communication. TESI® provides teams with valuable EI 360 feedback and team demographic responses to 7 EI areas: team identity, motivation, emotional awareness, communication, stress tolerance, conflict resolution and positive mood. Based on the extensive research of psychologist Dr. Reuven Bar-On, this skills-based psychometric assessment is designed for use in a wide variety of coaching, and development situations and work settings. It focuses on the impact of emotional intelligence at work and oﬀers suggestions for working more eﬀectively with team-members and supervisors. The EQ-i 2.0 Group Report combines the EQ-i 2.0 scores of individuals that take the survey in a manner that easily identifies EI patterns in the group, helping determine which skills need further development. Explore emotional intelligence and its role in effective leadership and workplace relationships. Identify emotional intelligence strengths and areas for development in five EI areas: self-perception, self-expression, interpersonal skills, decision making and stress management. Make connections between emotional intelligence and your effectiveness, resilience and well-being at work and in your personal life. Forté Communication Styles™ survey is a robust, highly accurate communication style report. It shares “who” you are, increasing communication style self-awareness, how you are currently adapting to your work environment and how you are “most likely” coming across to others. This detailed report outlines individual and team strengths, leadership styles, sensitivities, motivators, de-motivators, and where there is any potential for conflict. Based on this profile, individuals and teams strengthen workplace communication and performance. The Forté Interaction Report is a unique and one of a kind valuable tool in building and maintaining relationships within teams and between managers and direct reports. It helps two people communicate more effectively to accomplish common goals in a positive and productive way. Importantly, it highlights potential areas of misunderstanding and how to overcome them. The report creates direction and measurement for the development of a positive, trusting relationship. Everything DiSC Workplace® can be used with everyone in an organization, regardless of title or role, to improve the quality of the workplace. Participants understand and appreciate the styles of the people they work with. The result is more effective and productive working relationships. 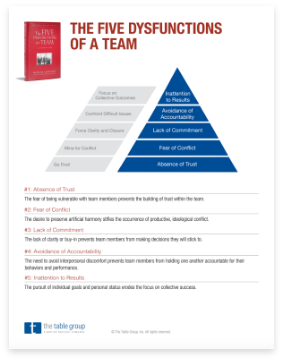 The Five Dysfunctions of a Team has become the world’s most definitive source on practical information for building teams. The model has proven effective for organizations of all sizes - from start-ups to mid-market businesses and Fortune 100 companies. The assessment outlines the root causes of politics and dysfunction on the teams where you work, and the keys to overcoming them.